The Princess Roza Swarovski earrings feature 8mm white pearls and sparkling 4mm crystal beads decorated with twisted 925 sterling silver wires pattern. 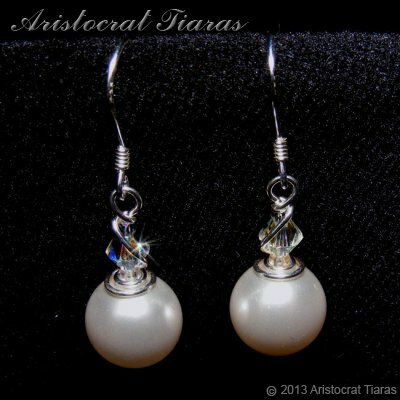 These simple crystal earrings from Aristocrat Tiaras give a bride an graceful look on her wedding. They are a perfect companion to the Princess Roza necklace and to compliment our bridal tiaras such as Princess Laura tiara.